We’re three hours into our almost-seven-hour train journey from Oslo to Bergen, so I figured this would be a good time to catch you up on our last day in Oslo yesterday! The train service actually has decent wifi, but I don’t know if it’s quite strong enough to handle my photos, etc., so I may end up finishing this in Bergen. Read on to find out! 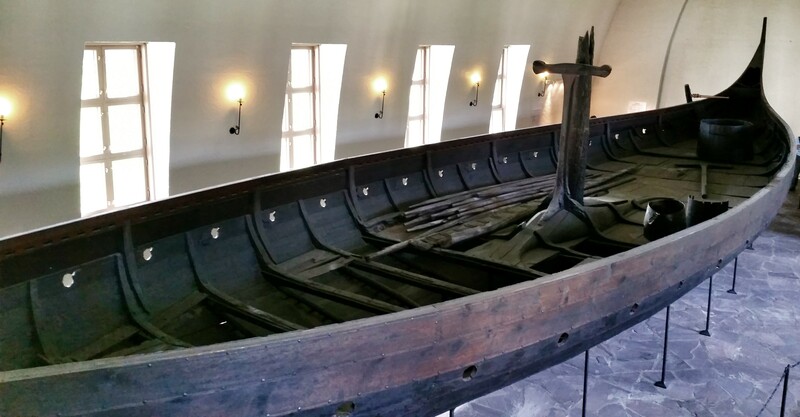 The Viking Ship Museum – if you have to ask what there is to see in this museum, you probably didn’t read the name too closely. 🙂 This place houses three unearthed viking ships, which were buried underground (after their time at sea) and later unearthed. This was a fairly standard practice, but I don’t know that many of them have been recovered, especially in the condition these ships are in (see photos below). 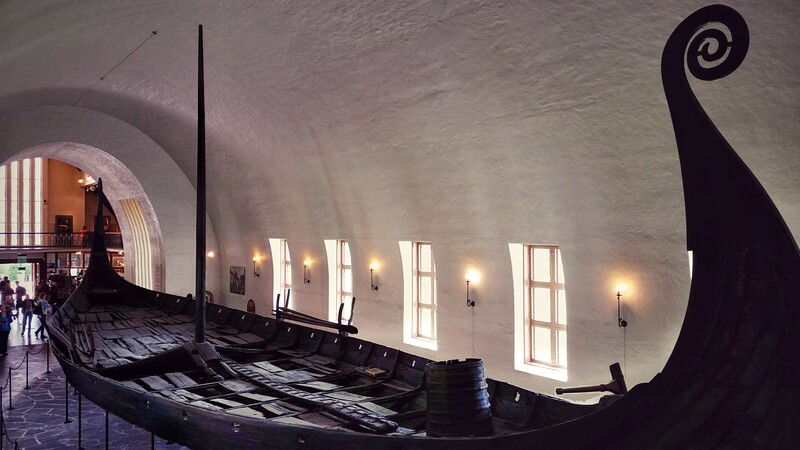 In addition to the actual ships, the museum also holds some of the items that were found with the buried bodies (each of the ships was used to bury different people) and does a great job of walking visitors through the process the vikings followed and some really interesting stuff about the preservation process, thoughts around who was buried in the ships, and more. I definitely recommend this one! Adult tickets are ~$10 USD, which isn’t a bad price to begin with, but that ticket also gets you into The Historical Museum. We unfortunately didn’t go to that one because it’s closed on Mondays, but it looks really interesting! A word of warning – museums are often closed on Mondays (not just in Norway, but throughout Europe), so be sure to check opening times, especially if you’re working on a tight schedule. 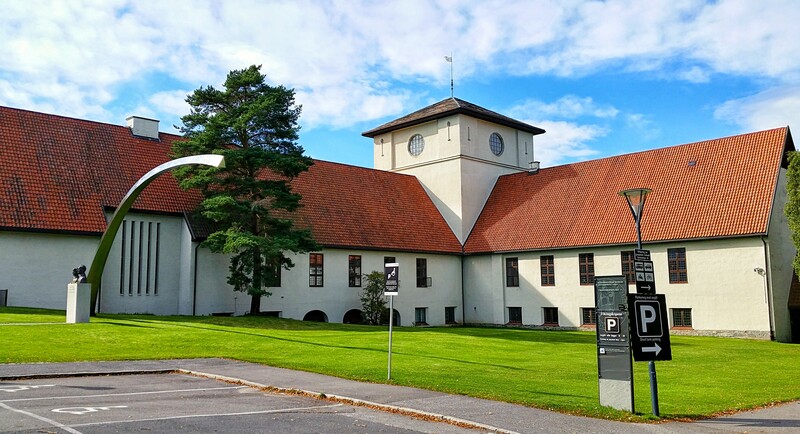 The Fram Museum – continuing our theme of visiting museums with ships in them, we moved on to the nearby Fram Museum, which houses not one, but two, ships used in Norway’s polar explorations (the Fram and the Gjøa). 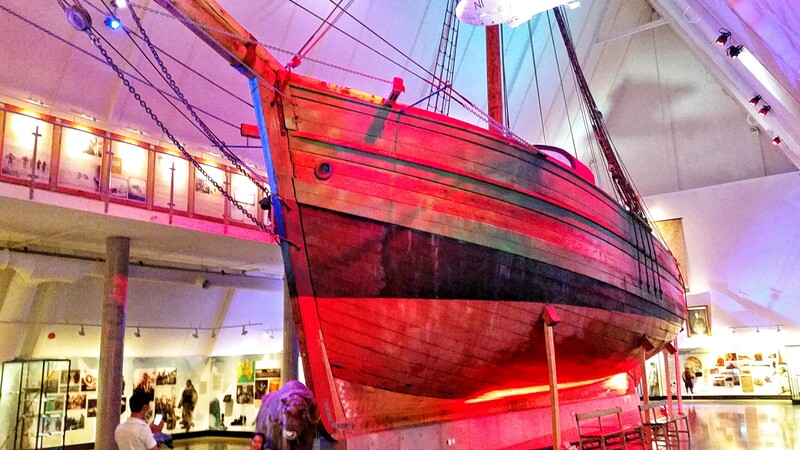 This museum is more hands-on as you can actually walk aboard the Fram and explore it. There’s a TON of great information spread across multiple levels (the ships are very tall and the museum is quite literally built around them, so there are a few levels to explore) and it was cool to learn more about polar explorations (which I was really interested in as a child, but of course we only learned about US explorers, so this was all new to me). The Fram is only slightly more expensive at ~$12 USD, but definitely worth it. This is a great option for children as there are some areas/content specifically geared to them. It’s worth noting that both of these museums (as well as a few others) are easily reached from Pier 3 (the same place we took our fjord cruise from) via the museum ferry. We love to walk, but it would have been quite a hike to walk all the way to those museums, so I’m really glad we caught the ferry! And it’s only ~$7 USD for a round-trip ticket, so it’s a great value. Your feet will thank you! We really didn’t do a whole lot else after the museums, so I probably should have written this blog last night instead of tonight, but hey, I’m on vacation! I did do some photo editing and we got a nice takeaway meal from The Kasbah, which was just around the corner from our apartment. So convenient! The food was really good and it was pretty well-priced (especially for Norway), so give it a try. Oh, the photos! Check ’em out! Just a fun, colorful sign. The National Theatre, near City Hall. 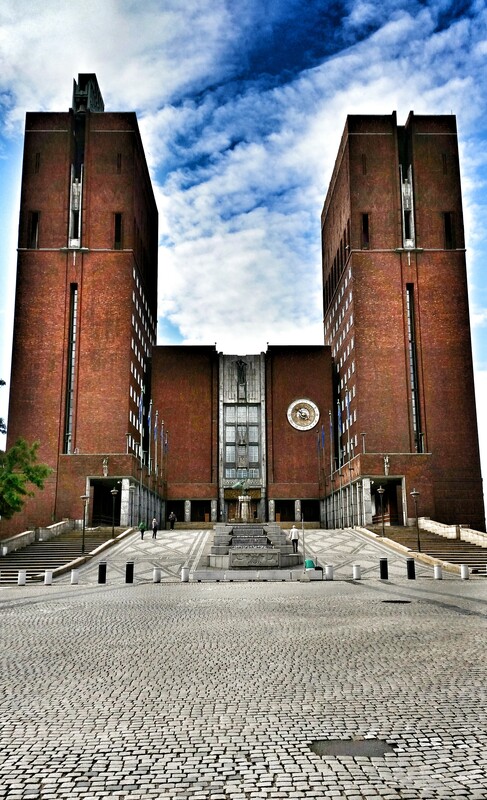 Oslo City Hall. It’s here that, on December 10th each year, the Nobel Peace Prize is awarded. 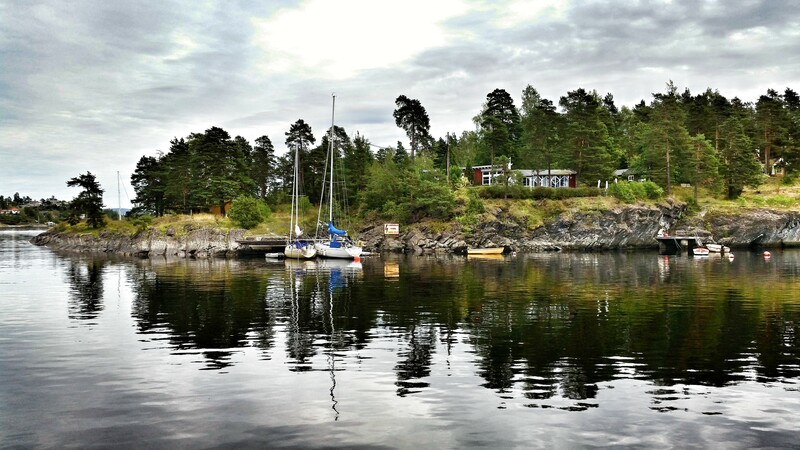 A shot from our fjord cruise. 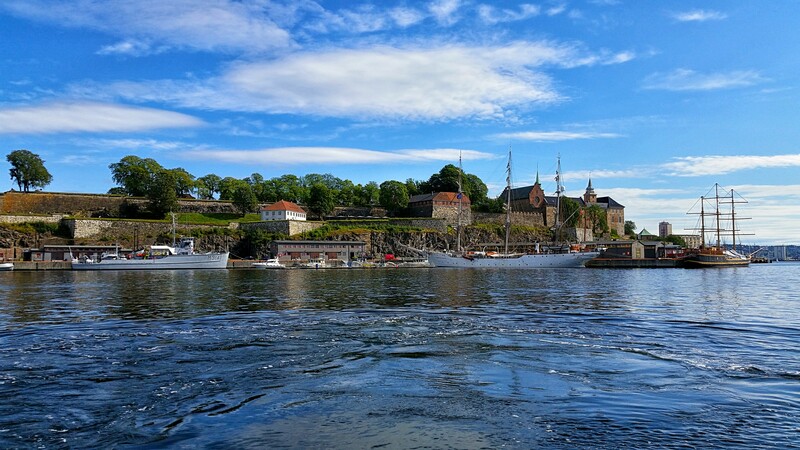 It was really cool to see Akershus Fortress from the water! Outside the Viking Ship Museum. The Oseberg ship, which was the final resting place of two women. The Tune ship, which is obviously not in great condition. 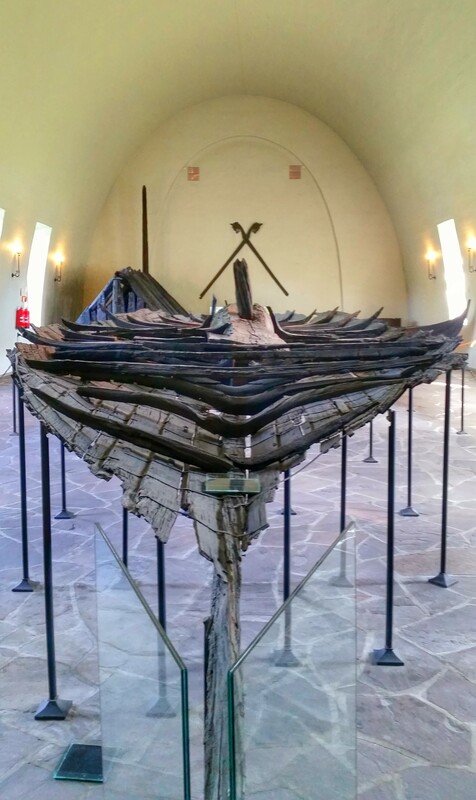 The Gokstad ship, where one man was found on a bed inside a burial chamber. 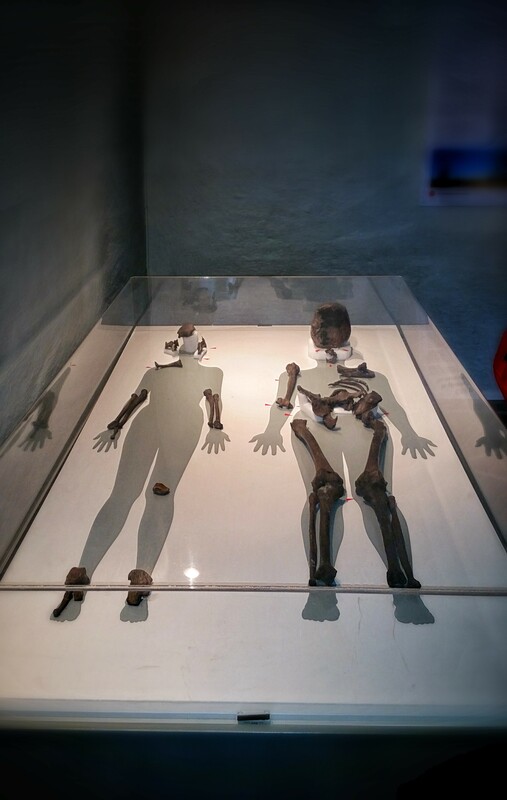 This is all that remains of the two women who were buried in the Osberg ship. 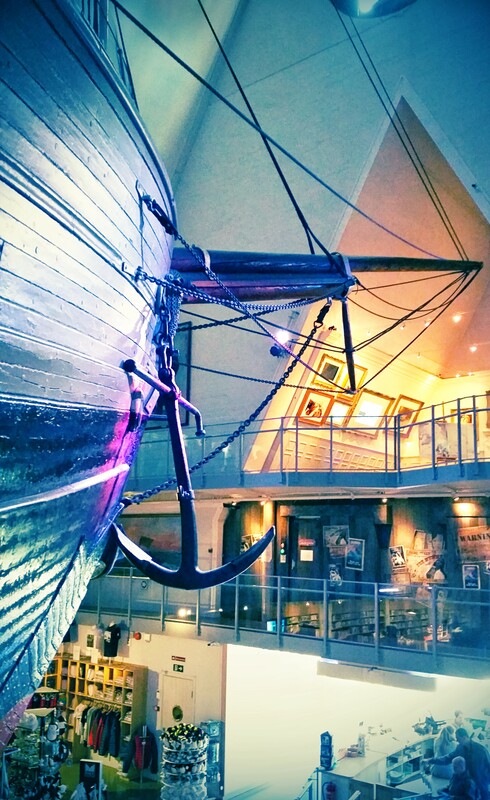 The bow of the Fram. The bow of the Gjøa. Not quite as big as the Fram, but still very impressive! 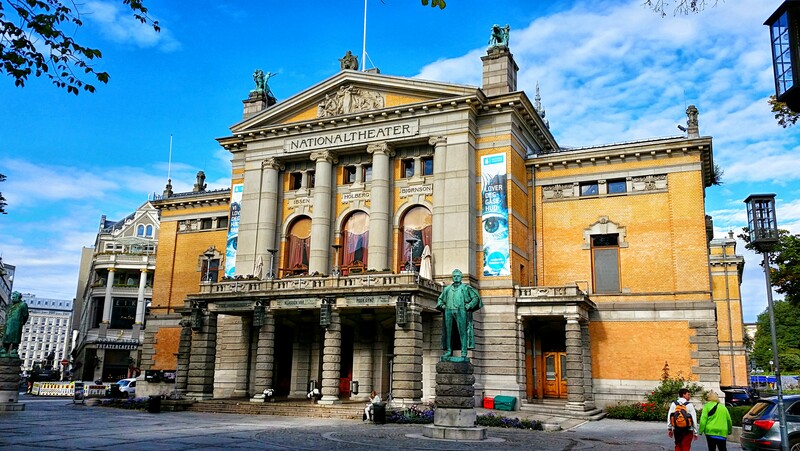 Oslo is a decent-sized city, so there are certainly things we didn’t get to, but I feel great about what we saw during our relatively short time there. We enjoyed our apartment, had great weather, and got a good sense of this fun city. 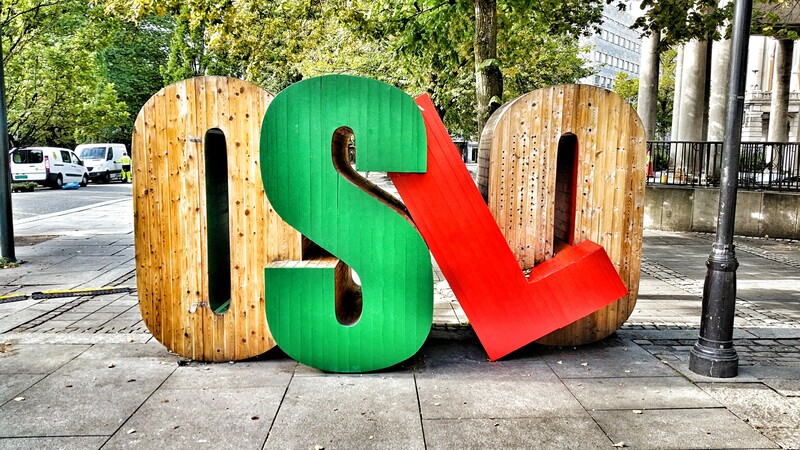 I’d love to hear stories of your time in Oslo – share them in the comments below! 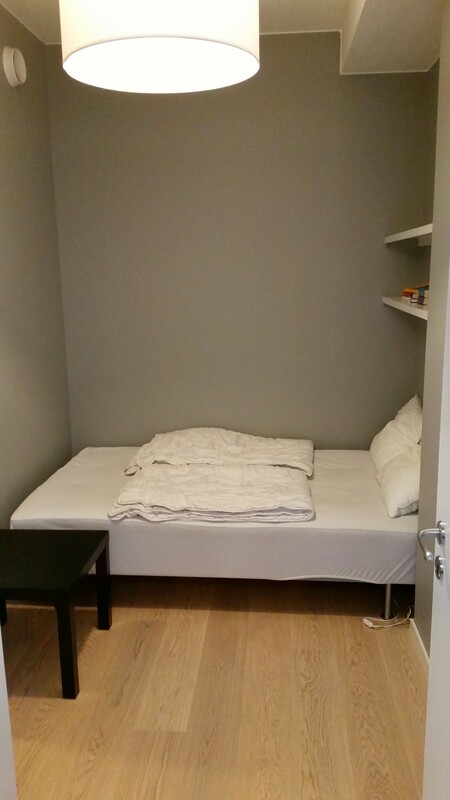 PS – In case you haven’t already figured it out, I didn’t finish this blog on the train to Bergen as the wifi didn’t end up being strong enough. But the fact that I’ve now finished it means we’ve arrived in Bergen safely! My initial impressions of this place are great, but check back soon for the full story! 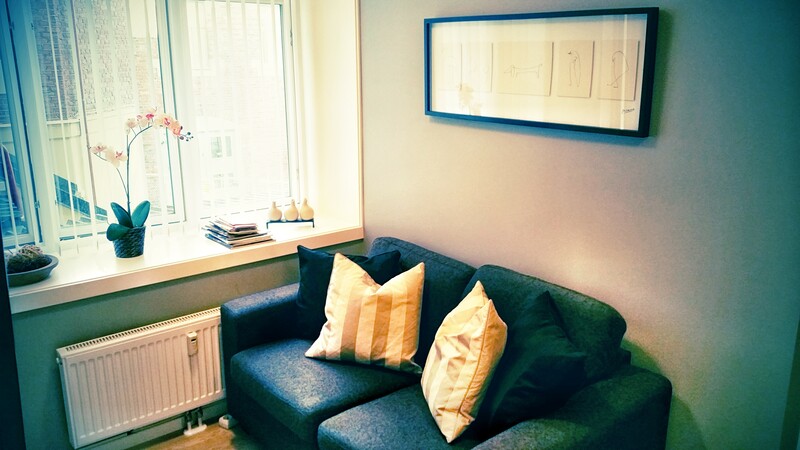 PPS – As promised in an earlier post, I did get pictures of our Oslo apartment as we were leaving! Rather than put them in their own post, I’m just editing this one to add them in. 🙂 Enjoy the quick tour! 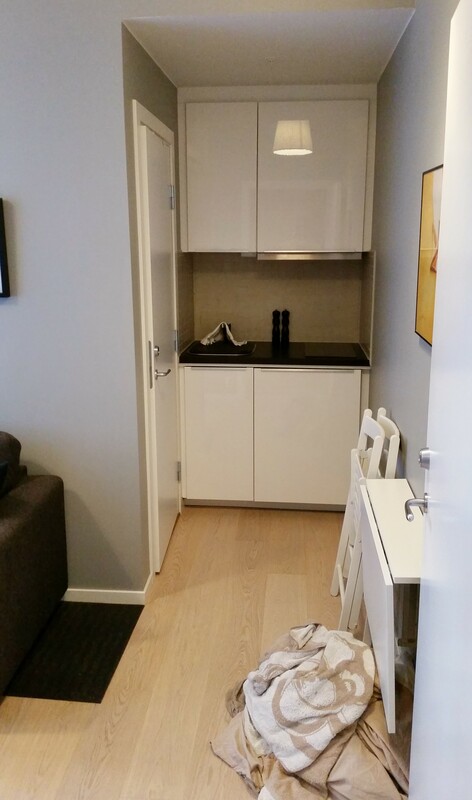 Looking towards the small kitchen area from the apartment door. Still standing in the apartment doorway, but turned to the left, you can see the small living room. 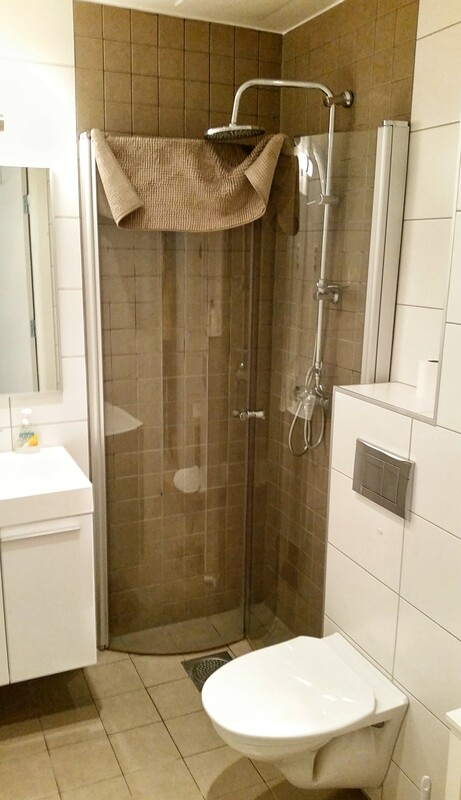 The bathroom is inside the door on the left side of the kitchen picture.